Killer Characters: Happy Holiday Giveaway! Welcome to the Killer Characters Season’s Readings Happy Holiday Giveaway!!! On behalf of Bridgy, Miguel, Ophie and all the folks at the Read ’Em and Eat café and bookstore here in warm and wonderful Fort Myers Beach along with our best buddies Carmela, Ava, Babcock and the fun and fabulous residents of New Orleans who you can read all about in the Scrapbooking Mysteries that our author co-writes with the marvelous Laura Childs, I’d like to offer you an opportunity to win one of these five books: Well Read, Then Dead, Caught Read-Handed or Read to Death from the Read ’Em and Eat series; or you may prefer Parchment and Old Lace or Crepe Factor from the Scrapbooking series. For a chance to win the book of your choice, please comment below and tell us which book you would like to win. Don’t forget to include your email addy in this format: name(AT)server(DOT) com to avoid the spam bots. Giveaway closes at midnight, Friday, December 22nd. Whatever holiday you celebrate this season, every one of us (and our authors too) hope it is a joyous one. Id like to win "Caught Read-Handed". But they all sound interesting. Thanks for the chance to win. I would love Well Read Then Dead. Thanks so much for doing this and enjoy this time of the year. Merry merry! I would love to be entered for Crepe Factor, thanks so much! Since this series is still on my TBR list I would have to choose the first one "Well Read, Then Dead." Thanks for this opportunity! Merry Christmas!!! 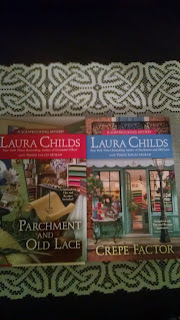 I would like to read Parchment and Old Lace..this sounds like a fun giveaway...thank you. There are several I'd love to have but to narrow it down to one I'd have to pick CREPE FACTOR from the Scrapbooking serieS. Thank you so much for the chance! Caught Read-Handed would be my first choice. 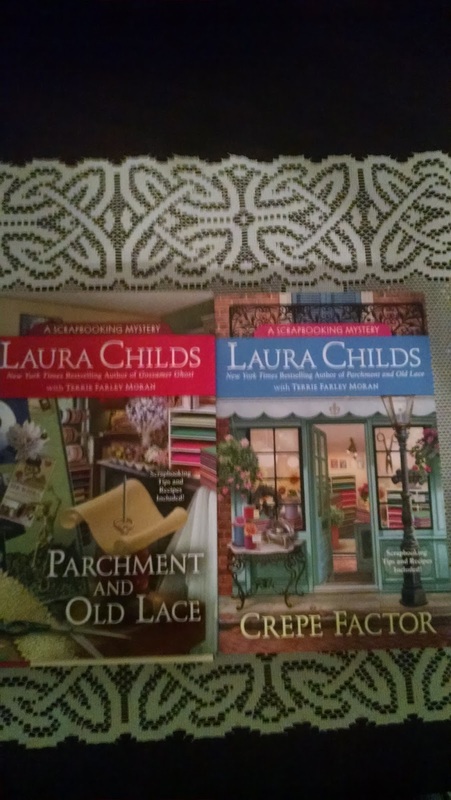 Marlene Ezell here.I would love to win Parchment and Old Lace. Thanks for the chance. Happy holidays! I'd like to win Caught Read-Handed Happy Holidays! I’d like to win Well Read Then Dead. I'd like to win "Well Read, Then Dead." Thank you. I would love to read any of them. If I have to choose, I would say "Well Read,Then Dead" please. Thanks for the chance. I would love to read "Crepe Factor". Thanks for the chance. Merry Christmas! I'd like Read to Death, please. Thanks for the chance! My choice is Well Read, Then Dead. Thanks for the chance. Happy Holidays! Happy Holidays . I would love to read Crepe factor . Would love Parchment and old lace. Thanks for doing this. I would love to win Well Read, Then Dead! Fabulous thank you. PARCHMENT AND OLD LACE thanks. I love the title Read to Death. Thanks for the chance and Happy Holidays to all. LibraryLady80 (at) gmail (dot) com. I would love Well Read. Thank you for this giveaway. I would love to win Parchment and Old Lace. Thanks for the chance. Happy holidays! Well Read, Then Dead would be my choice. Thank you. Merry Christmas! "READ TO DEATH". happy holidays! If my name were chosen I would choose Crepe Factor as This book sounds great!! Howdy! I would be ecstatic to receive any of them... I've read a couple but I would love to have them in my library! I would love to win Parchment and Old Lace. Since I haven't read any of them, any book I'd win would be great. The Title of "Caught Read Handed" grabbed my attention. Thank you for the giveaway. I'd choose Crepe Factor if I were chosen. All are great but I have not gotten Crepe Factor yet. I would love to win Well Read than Dead. Thanks for the chance. Merry Christmas!!! I would like to win Read to Death. Thank you! Read to Death would be my choice! Great giveaway! I would like Crepe Factor. Thanks for the chance. Merry Christmas and A Happy New Year. I would love to win Well Read then Dead. Thanks for the chance. Mahalo and Happy Holidays from Hawaii! Comments are closed. Thanks to all participants and a happy holiday season to all. We are the characters--major and minor--who inhabit the pages of some of your favorite cozy mysteries. We're coming out from between the covers and welcoming you into our lives. So grab a nice cuppa, settle in, and learn what happens when our authors aren't looking. Great news... Killer Characters came in at number 20 among the top 50 mystery blogs! Provide your contact information, and our authors will let you know when our books are coming out!